Trust our 45 years of Consistently Good San Diego Carpet Cleaning! You will LOVE our unique cleaning method that yields full soil extraction without non-stop water immersion. Not Your Ordinary San Diego Carpet Cleaner. Our reputation speaks for us. Trust our high rate of returning clients, our non-stop stream of friend-to-friend referrals, our high-quality Yelp reviews, our 45 years in San Diego, our quality technicians and office staff, our quality method, equipment and materials, and our 2015 BBB Reliability Report. Also, view before and after photos! 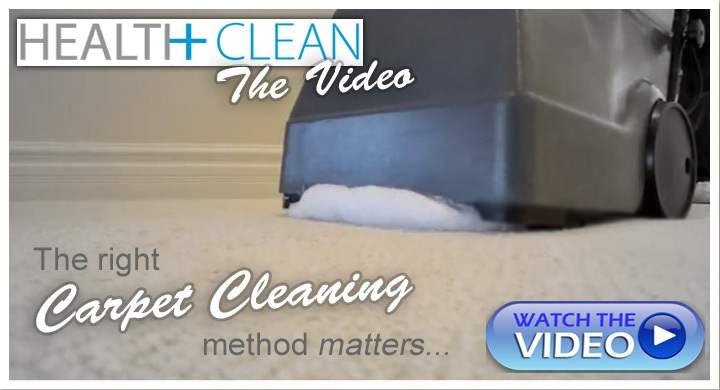 Click on video watch your very own carpet cleaning technicians in action! Quality from start to end. From your initial conversation with our competent, polite office staff to your experience with our courteous technicians, to your delight over a job well done, you will be pleased in your choice of carpet cleaning company. Reviewer Angela H. writes, “I have been using Tony’s Best Way for over ten years- their service, impeccable attention to detail and pricing is very competitive. And well, the facts do not lie… the carpet looks less than a year old. ” A good, quality cleaning service company saves your valuable time, money and even your sanity! 90%+ of carpet cleaners rely on harsh chemicals to encourage fibers to release their soiled contents by induced agitation. 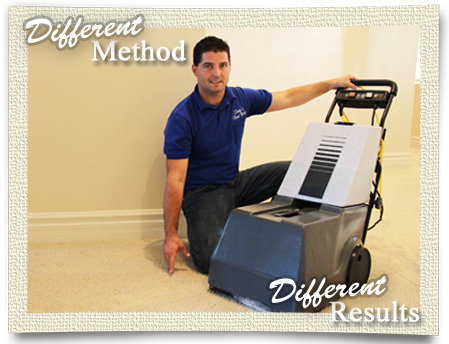 Our method relies on carpet-safe physical agitation with just a small amount of our own tailored formula. We also include a non-toxic sanitizing agent for more safe and effective cleaning. Beware of green cleaners who use weak-performing natural formulas. We believe in really cleaning – even though we don’t use heavy amounts of harsh chemicals. For the very sensitive, ask for our 100% non-toxic formulas! …”Green & Non-toxic carpet cleaners San Diego”, “Dry Carpet Cleaners San Diego”, and “Zero Residue Carpet Cleaners San Diego” and the list goes on. ...ARE the most common. . . but are they the BEST? Does it Matter…How Different Methods Loosen Impacted Soil?Does it Matter…Which Direction Carpet is Cleaned? Does it Matter…How Carpet Cleaning Companies Use Water to Clean?Does it Matter… What is Left in Your Carpet After a Cleaning?Does it Matter…How Cleaning Methods Impact the Environment? Does it Matter…That Carpet Cleaners are Accessible? Does it Matter...How Different Methods Loosen Impacted Soil? Vacuums only suction loose soil. How do pros attack the stubborn stuff? Regular Steam Cleaning is powered by a mix of pressurized water and a harsh chemical detergent. This creates a forceful stream of liquid. The water pressure alone cannot dislodge all the soil, so strong chemicals are used to chemically knock soil from carpets. This water-chemical mix is also extremely hot in order to sanitize, and perfume-type chemicals are used to deodorize. Steam Cleaning cleans moderately but are you comfortable with the type and amount of chemicals used? Health+Clean harnesses the power of Activated Oxygen, a mild detergent and physical agitation to dislodge soil, clean, sanitize and deodorize. We transform a small amount of liquid into a cleansing foam. We heat the foam but not to extreme temperatures, avoiding heat damage. The almost dry, heated foam physically covers the carpet fibers. Soil is instantly drawn into the foam like a magnet. Our Health+Clean method allows us to remove a higher amount of soil while not needing to use harsh chemicals . Does it Matter...Which Direction Carpet is Cleaned? Steam Cleaning is a “top-down” cleaning method, meaning, starting at the top of carpet, pressurized cleaning liquid pushes soil down deep into the carpet before the suctioning stage. Cleaning by forcefully pushing dirt down to the base of carpeting, and then suctioning the soiled water back up through the maze of carpet fibers, means an amount of soil “cleaned” will be re-trapped. Just walking on carpeting during normal use can pull up this non-removed soil in a short time. And, after suctioning, watch for a trick some cleaners use…a respraying of the surface to push down (and leave behind) remaining soil. People who are disappointed with steam cleaning's lasting power may find this is due to the forcing of soil underneath the carpet's visible surface. There is an alternative! Health+Clean cleans from the “bottom up”, meaning we systematically clean and suction the base of carpet, the middle and the surface of carpeting. WE DO NOT PUSH DOWN remaining soil to the carpet’s base as a finishing step. This makes for a very clean carpet that stays that way. The science behind Health+Clean makes perfect sense and is thus effective and efficient. We owe our excellent soil pickup rate up due to our foam’s “magnetizing” property! Does it Matter...How Carpet Cleaning Companies Use Water to Clean? Steam Cleaning is a slow-drying system due to its high moisture nature. Water flows into carpeting in a constant stream. . .up to 1000s of gallons for a single job! Carpets can take several hours or even days to dry. Some steam cleaners use powerful fans to speed up drying but even so, water is heavy and abrasive. Dried water can leave mineral grit. Grit nicks carpet fibers, making numerous soil traps and upping resoil rates. Also, most San Diego steam cleaning companies use truck mounted equipment -heating liquid up to 270°F! This intense heat is hard on all fibers and can even shrink certain types. Steam Cleaning uses a lot of water. The hot water used is heavy, abrasive, and takes lots of time to dry. Health+Clean ​is naturally a fast-drying and low moisture cleaning system. It’s true, moisture is needed to clean effectively, however, “little is more” is decidedly true in carpet cleaning. Our amazing cleansing foam is made up of just 10% moisture elements and 90% air cells. Carpet dry times depend on amount of soil present but most carpets dry in only 6-8 hours with air flow. Beware of other cleaning methods whose only selling point is no dry times. To clean carpets well you must use moisture. We at Tony’s Best Way Cleaning have been pleased to offer you the driest form of wet cleaning for over 40 years. Our method is the driest form of wet cleaning; saving up to thousands of gallons in a single job! Does it Matter... What is Left in Your Carpet after a Cleaning? Cleaners should leave only clean carpets behind - not throw in a wrench! Carpets sticky with leftover steam cleaning detergent darken fast and stay that way. Based on our expert experience, steam cleaning detergents undoubtedly leave this sticky residue if the carpets they treat are not properly rinsed. It is obvious to us when a low paid steam cleaning technician was in a hurry and didn’t take the time to do the job right. Sticky soap residues left behind poor treatment can cause carpets to quickly re-soil. Even worse are rental cleaning carpet cleaning machines (both steam and non-steam versions). We see the telltale black/brown stripes down hallways and stairs and we know what happened. Again, the culprit was leftover sticky, detergent residue and again, it was not properly rinsed. Darkened non-vacuumable carpeting can indicate someone left sticky detergent in your carpets and that is unacceptable. Save time and aggravation (and your carpets) by calling Tony's Best Way Cleaning of San Diego today! Because our Health+Clean method doesn’t necessitate large amounts of detergents in order to agitate carpet fibers, you also don’t need to worry about all the negatives associated with the possibility of left-behind detergents in your carpets. When people hire a carpet cleaner they often don’t even know to be concerned about what the cleaner may be leaving behind. Especially dark, soiled carpeting areas that are due to non-rinsed detergents are horribly resistant to cleaning. No matter how much you vacuum, they will not respond. On top of that, who wants dried up harsh chemicals in their carpets, infiltrating their family’s breathing air and possibly negatively affecting their health? Be very aware that cheap prices come with cheap job quality. Our method of cleaning leaves no sticky residues behind to attract soil. Your carpets will stay beautifully clean long after we clean them. Does it Matter...How Cleaning Methods Impact the Environment? Steam Cleaning by its very nature ​is rough on the environment. Most steam cleaners own water heater/pressure machines that are truck mounted and thus, powered by gas guzzling engines. Water consumption is extremely high as well; an average sized job of 800 ft2 can use up to 1000’s of gallons! And, most often, very strong cleaning chemicals are used. It’s a shame that so much chemical, fuel and water waste is produced when there is another (and may we say, fantastic) way to clean! There are serious concerns about the heavy handed use of water, fuel and harsh chemicals with this carpet cleaning method. Some people are not comfortable with the harsh chemicals, nor with the amount of natural resources used. Tony’s Best Way has saved at least millions of gallons of water and hundreds of gallons of fuel from immediately impacting San Diego over the years. You will be happy to hear that our method, Health+Clean, is environmentally responsible. No harsh toxic chemicals are used, and only a small amount of water and electricity are needed to get any sized job completed. It’s amazing to consider that, on an average sized job of 800 ft2, we at Tony’s Best Way Cleaning use only 10-15 gallons of water! Our Health+Clean method allows us to shut off our fuel consumption when we arrive, only use a small amount of hand-poured water in our machines, and use vastly less chemicals -or none at all, if you prefer! All the Above Reasons Matter...and These Do Too! HOSES -ARE THEY NECESSARY FOR CARPET CLEANING SAN DIEGO? Steam Cleaning hoses need to be pulled all over your home (or over foyers or your balcony) to reach the carpeted areas, potentially scratching floors and damaging corners and furniture. Also, pet owners be aware that steam technicians run a hose through an open door. Pets will need close monitoring! Our method doesn’t necessitate long hoses or open doors. Our machines are self-contained and only require outlets. That’s good news. Besides being non-damaging, you will have no cause to worry if you (or your building’s HOA) are adverse to hoses on balconies or dragging through common areas. Steam Cleaning companies often are “on a leash” and many cannot clean on top of high rises nor hard to reach areas or on vessels.The further you get from truck mounted machines, the less cleaning power. Our method can clean top floors of high rises, vessels (we service even even naval ships! ), and other hard to access areas and locations without any loss of cleaning power. Our power is in contained in our machines, our own secret formulas and of course, our amazing and responsive cleansing foam! HOW LONG WILL THE CARPET BE WET? Before we apply our cleansing foam via special carpet cleaning machines we do a great job of pre-treating “hot spots”. This breaks up the oil and sugar that makes soil sticky and gummy. We then use a Tony’s Best Way exclusive formula that softens up this impossible-to-vacuum soil embedded in your carpet or furniture. How much moisture we use depends on the condition of your carpet or furniture. The more soiled the item, the more moisture. The more moisture: the longer drying time. Remember: we use a super low moisture content dry foam extraction method that already qualifys as low moisture. While that is true, also keep in mind we may have to re-clean heavily soiled areas up to 10 times more than we would do so otherwise. This, obviously, adds more moisture that will take longer to dry. We do not clean for fast dry times. We assume your first priority is to have us clean your carpet and furniture with astoundingly clean results, even at the risk of them taking longer to dry. However, if you would like us to focus more on dry times, we will be HAPPY to accommodate. We understand sometimes seniors and others cannot be away from their living spaces for even 6 hours. Just let us know and we will customize your cleaning! Keep the air temperature at 70 or above and the carpet/furniture will dry nicely. A house kept at 60 or under will hold moisture in, so it will take the carpet longer to dry. Do increase the air movement as much as possible. Leaving windows and doors open, keeping air conditioning or heating on, and using ceiling and/or portable fans all greatly speed up dry times. The more combinations of air movement the better! Use the drying time as an excuse to hit the beach or go to Pannikin’s for coffee and time with a good book! If you live alone or with one other person and would like to keep your carpet in like-new condition, we recommend a complete cleaning once every two years. If you have pets, children, have a home business, or if you smoke, we recommend one complete cleaning each year. These “atmospheric pollutants” are only some of the things that are potentially in “ripe” (very soiled) carpet. Whenever you step on ripe carpet or sit on that similarly ripe couch, clouds of atmospheric pollutants rise up. That’s not just dust! It doesn’t just make you sneeze, you actually inhale this mini air zoo! Small adults, children and pets (which are closer to the floor) are more affected by this bad R.A.P. (ripe atmospheric pollutant) scourge because, obviously, there noses are closer to this soup of pollutants. 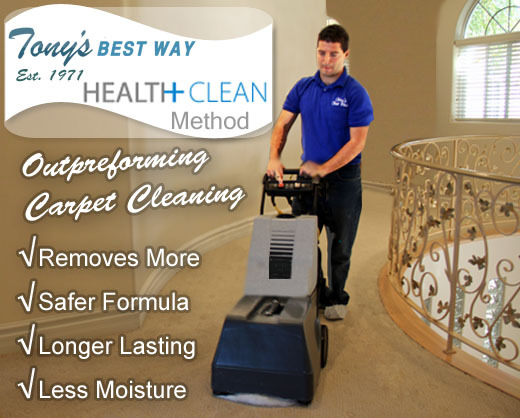 Keeping your home’s carpets professionally cleaned on a regular schedule is actually a healthful practice. Air filters must be cleaned to be effective and your carpet may be the biggest air filter you have! 1. Vacuum carpets daily . Yes, daily! If this task is too bothersome, purchase a robotic vacuum cleaner to do the job for you. Vacuuming prevents soil from bonding to fibers, and keeps them from sinking down to the base of your carpet. There are lots of good vacuums out there. Tony recommends the Miele S2121 Olympus Canister Vacuum Cleaner from Germany . It has a strong pickup and a three-stage filter. It’s almost fun to use and it’s versatile. You can use it for carpets, hard floors, upholstery and drapes. 2. Make sure all hard surfaces (tile, wood, slate and marble) are cleaned daily or weekly. Pay close attention to the hard flooring in home entrances and kitchen and garage areas. This is important. You will not have clean carpets if your hard surfaces are filthy. To test these surfaces for soil, place a small amount of cleaner on a towel and wipe. This will show you what is being tracked onto your carpet. Tony’s Best Way offers professional stone, tile, slate and marble cleaning for annual or biannual cleanings. In the meantime, washing down outside areas with a power washer will help keep soil from building up. 3. Make sure no one uses outside shoes or bare feet on your carpet. Post a “no shoe tradition observed here” sign and offer guests slippers. Shoes track in a lot of soil -especially if they see asphalt regularly. Going barefoot means you are injecting body oil into carpets. Soil clings to oil and oil clings to carpet fibers. Body oil can permanently stain carpets if given enough time. Slippers or socks worn need to be worn at all times. 4. Place clean mats in entrance areas, around dressers, in bathrooms, and other heavily used areas. Tony recommends purchasing extras. Replace or clean mats as necessary. 5. Consider keeping pet accessible areas separated from carpeted areas. Dogs especially are very hard on carpet. This is a hard one if your pet is considered a family member, however dog fur contains a great deal of sticky body oil. When they lie down or even just shed, this oil will end up in your carpet. Of course pets that are not housebroken or who are sick can challenge your carpets cleanliness as well. Consider setting up barriers to carpeted areas if keeping your carpet cleaner longer is important to you. 6. Never use cheap carpet cleaners. And never ever use do-it-yourself carpet machines. Do-it-yourself carpet machines are terrible on carpets. Tony says he can almost always tell which homes are subjected to such abuse. They sport black stripes down hallways and other highly-used areas. If you use a low cost cleaner or a do-it-yourself machines, insist on plain water being used. It certainly will not clean half as well (or last as long) as our method, but at least there will be less damage and no chance of sticky residue. Sticky soap residue left by underpaid and in-a-rush cheap cleaners will assuredly and severely shorten the life of your carpet investment. 7. 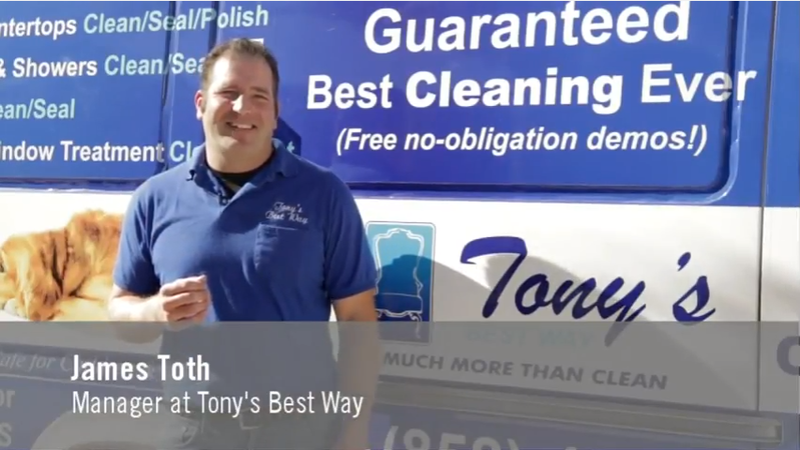 Only use Tony’s Best Way instant carpet cleaner to get out everyday stains. Our formula is top notch. Many former San Diegan customers have called us and ordered bottles of it because they can’t get its results anywhere else. Use of inferior products can set stains, change the chemical composition of stains (which make them harder to clean), and some even bleach carpet! We hope that you will find these tips helpful and that you remember us at Tony’s Best Way when your carpet, rugs, furniture, hard floors and drapes are in need of powerful and through professional cleaning. Does your sofa need a good cleaning too?